Note: The winners of the 2019 Postdoctoral Scholar Award for Excellence in Mentoring will be announced at the Mentoring Circles Program celebration event May 16. The BWH Postdoctoral Association (PDA) Mentoring Circles Program (MCP) and the Office of Research Careers (ORC) are seeking nominations for exceptional BWH postdoctoral fellows who dedicate time and energy in mentoring fellow postdocs. 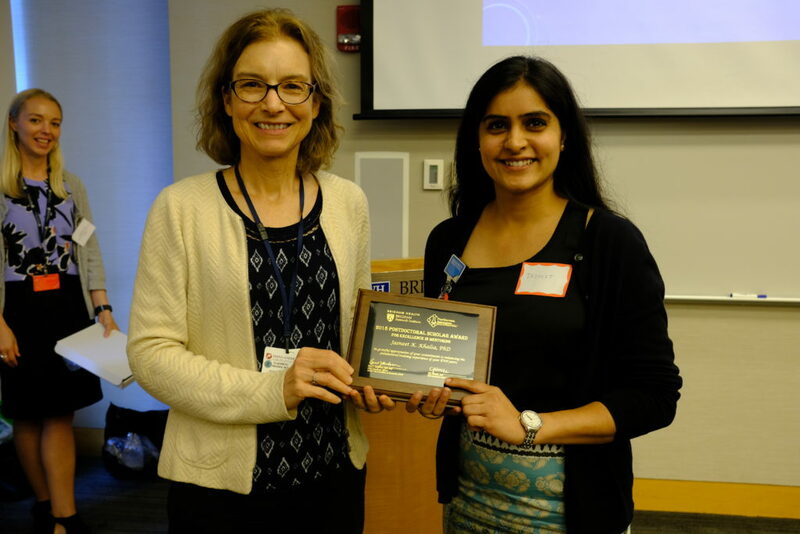 The Postdoctoral Scholar Award for Excellence in Mentoring is awarded annually to the BWH postdoctoral fellows who best exemplify the role of mentors and who have provided exceptional mentoring to one or more BWH postdocs. This award recognizes postdoctoral fellows’ efforts in mentoring other postdocs in research projects and/or career development. These efforts help to promote a vibrant and collaborative research community at BWH. To nominate, write a statement of support that gives one or more examples of how this postdoc has impacted you as a mentor. Two winners will receive a certificate at the annual Mentoring Circles Program Celebration on May 16, 2019 acknowledging their accomplishments in mentoring. In addition, these individuals will be awarded a travel grant of $1,000 sponsored by the ORC and Brigham Research Institute (BRI). Postdoc candidates for this award must be nominated by members affiliated with any of the HMS hospitals. Faculty can also nominate. A candidate may be nominated by multiple people, which will weigh favorably into award candidacy. Self-nomination is not allowed; however, we suggest that you encourage lab members that you have mentored to nominate you. A brief statement (250-500 words) of the postdoctoral fellow’s mentoring and its impact on the postdoctoral appointee’s development. Mentoring can relate to research design and progress, career and professional advice, personal guidance, and/or other aspects of a postdoctoral appointee’s development. The statement may also include descriptive accounts of how the nominee has served as a mentor for postdocs generally, and other mentoring examples as appropriate. Letters should be submitted electronically to the PDA by email to mcp.pda@bwh.harvard.edu no later than April 15th, 2019. Please write “Postdoctoral Scholar Award for Excellence in Mentoring” in the subject field. If you have questions or need further assistance, please contact us at mcp.pda@bwh.harvard.edu. Helping with the academic, personal, and professional goals and needs of postdocs. Recognizing that there are multiple career options available for postdoctoral appointees and providing assistance in exploring appropriate options. Connecting postdocs to appropriate intellectual and professional networks. Guiding postdocs / lab members toward intellectual and professional independence. Helping young scientists to create individual development plans for their professional careers. A committee assembled by the MCP and ORC will review the nominations and select the postdoctoral fellows who are judged to have had the greatest positive impact on other postdocs. The committee will be blinded from names of the nominees and will judge according to the nomination letter. Final selections will be announced at the annual Mentoring Circles Program Celebration. 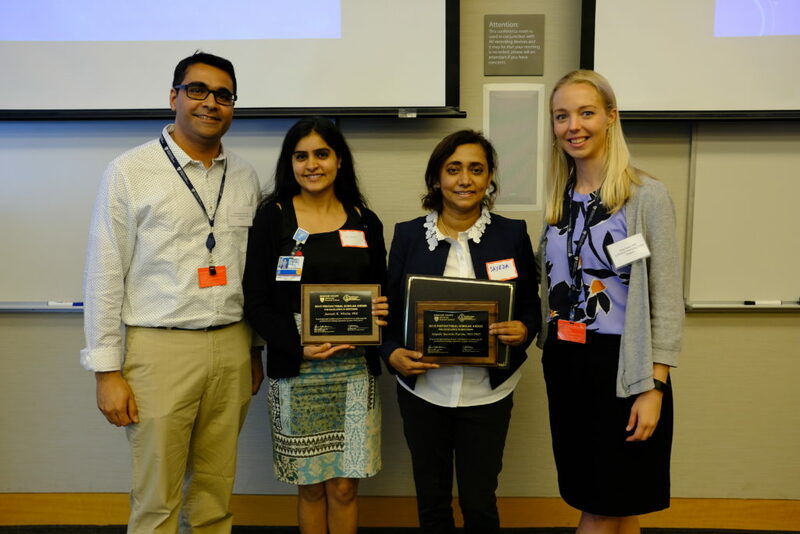 The 2018 recipients of the Postdoctoral Scholar Award for Excellence in Mentoring are Jasneet Khalsa, PhD and Sayeda Yasmin-Karim, MD, PhD! We thank them for their outstanding efforts in the mentoring of fellow postdocs. 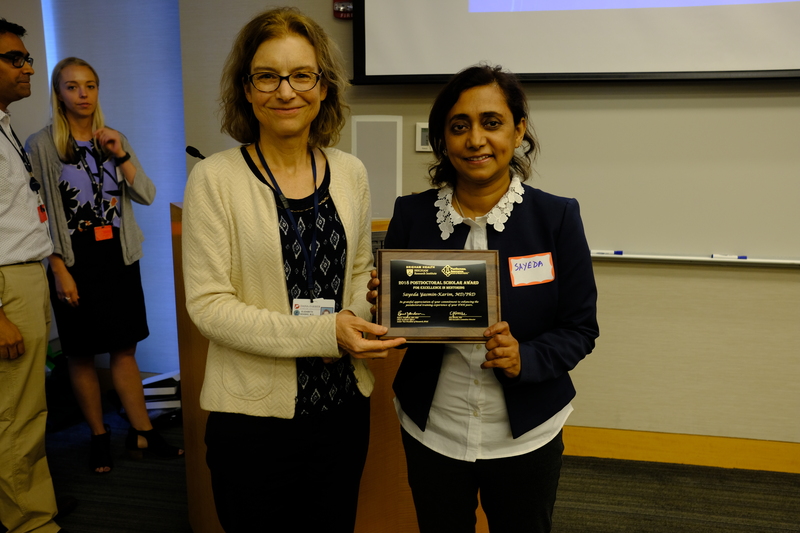 MCP Co-Directors presented (Budhaditya Banerjee, PhD and Margaret Parker, PhD) awards for the Postdoctoral Scholar Award for Excellence in Mentoring. 2018 Inaugural recipients are Jasneet Khalsa, PhD, and Sayeda Yasmin-Karim, MD, PhD. They both received $1,000 as travel awards. I am an immunologist by training with a keen interest in tumor immunotherapy. I joined the Center for Stem Cell Therapeutics and Imaging, Department of Neurosurgery at BWH in 2017 after obtaining my Ph.D. in immunobiology at National Institute of Immunology, India. My current research focuses on understanding the body’s immune response to a growing brain tumor and to utilize that information to further immune-cell based therapies for Glioblastoma. I have a strong interest in teaching and mentoring, and I would like to thank BRI for the BWH Postdoc Mentoring Award in 2018 that encouraged me to join the Mentoring Circles Program as a co-director. The $1000 travel grant has enabled me to attend an international conference on cancer immunotherapy. Mentoring is like having a confidante or a coach who can help make better decisions at various stages of one’s career based on his/her experience. It is not about giving an answer to the mentee but instead to challenge and train the mentee to think through the problems that would eventually help the mentee expand his/her horizons. Mentoring has helped me hone my interpersonal and communication skills and it has expanded my network. Mentoring has been a fulfilling experience as it has given me a chance to reflect upon myself and the has provided satisfaction in paying it forward. I am a postdoctoral fellow in the Department of Radiation Oncology at BWH, Dana Farber Cancer Institute, and Harvard Medical School. My current research interests include enhancement of the anti-tumor immunity using different nanomaterials, biological agents, and radiation. I believe mentoring helps junior colleagues to facilitate their performance more efficiently. The Mentoring Circles Program (MCP) gives both the mentees and mentors a great level of satisfaction and benefit by sharing their thoughts and I am very happy to be a part of this since 2016. I believe mentors are also able to increase their confidence due to their frequent interaction with mentees. Sometimes mentors become one of the most influential person in someone’s life and it can be a game changing experience. I am fortunate to have mentors at various stages in my career and their guidance helped in my professional growth. I’d like to mention Dr. Larry Smith from Sloan Kettering, Dr. Michael King from Cornell University, Dr. YiFen Lee from University of Rochester, Dr. Wilfred Ngwa with whom I am currently working, who influenced me in various ways on my current career path. I am still connected with my previous mentors and grateful to them. I believe mentorship does not mean a teacher-student or boss-subordinate relationship, it is just a pathway of advising, directing, and motivating junior colleagues, peers, or even sometimes peer-mentors. Anyone who likes to devote some time to give guidance to their peers or juniors toward their personal (psycho-social) and professional growth can be a mentor. I would like to appreciate BRI for the organizing the BWH Postdoc Mentoring Award program and very happy to earn this in 2018. I am thankful to my colleagues who nominated me for this. Learn more about the Mentoring Circles Program.